Outlook now is not only a medium of email communication but it is also used to share events with calendar feature, organize tasks, maintain our contacts and much more. With so much features there also comes complexity of an application. Some time users itself interfere with file structures, change directories and therefore it creates problem with Outlook. One of these problem is that Outlook Keeps Prompting for Password. It’s really very annoying with an application that is used mostly in your work hours. 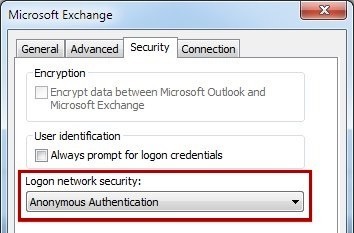 Here is a solution on how to fix Outlook Password Prompt issue. The Main issue is with the MS exchange settings. The Logon network security setting is different from that is required. The settings in security tab should be set to Anonymous Authentication. This problem mainly occurs in earlier version of Outlook other than 2016 and 2013. In Login network security list, select Anonymous Authentication option and then click OK. Finally Click on Finish and Close the dialog boxes. The problem occurs due to Network Security settings. If the same happens in Outlook 2016 and 2013 then you can use Support and Recovery Assistant (SaRA) tool to troubleshoot problems with these version.